The day has finally arrived! I final got off the procrastination bus and completed the last drawing for my self imposed challenge “One Zentangle a Day” from the book by Beckah Krahula! I knew going in that I would not be able to truly complete this task in six weeks, but little did I know that it would almost take me over a year! My life took many twists and turns along the way from work stresses, to distractions to beloved family members passing away. Each tangle I completed was like a little bookmark in my life. I will treasure each one always. For this last day’s challenge the author asked us to make a simple line drawing and combine it with the tangles we learned throughout the book otherwise known as a ZIA (Zentangle Inspired Art). 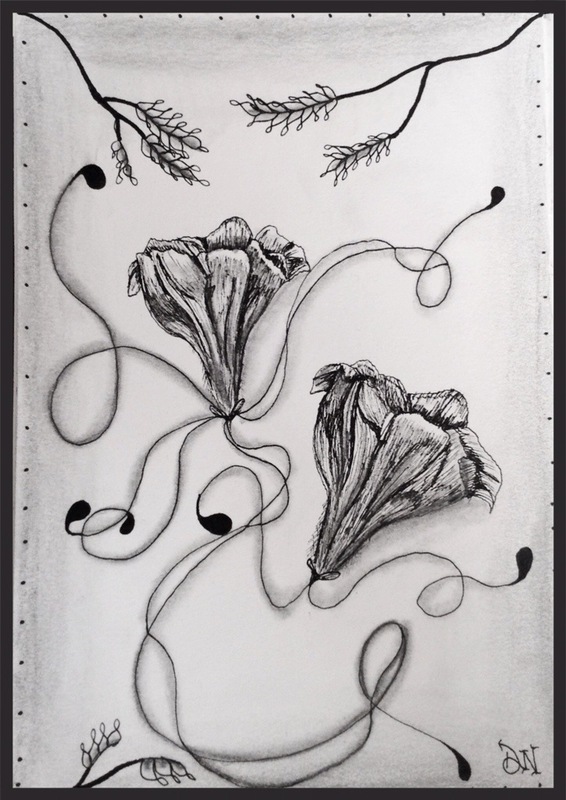 I finally sat down this evening and started drawing some traditional pen & ink petunia flowers and added some of my favorite tangles like “Fescu” and “Tat”. I took a very free-flowing approach to this drawing. It was nice to finally take the time to start and complete this drawing in one evening. Now that I completed this challenge what is next for this little artist? I can tell you one thing, it won’t be another challenge any time soon. I think I will take the time now to explore other avenues. Why not take the time to learn some more tangles, create new ones or simply have fun filling in my visual journal. After all, I started this blog to chronicle my art journey. Not for profit, not for notoriety, but just simply to relax and enjoy the process! Now that I am back, stay tuned as I will post the tangles I created during my South Dakota trip. Next Post Sock it to me and more placemats! Very pretty! I loved the picture! I really got what u were saying. 😀 LUV ya!! !